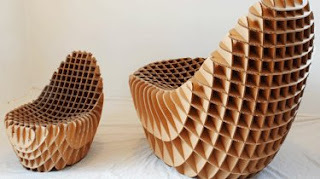 These Chick 'n' Egg chairs are made entirely from corrugated cardboard. The lightweight chairs were designed completely in Rhino and Grasshopper by the Swiss architectural design studio, Responsive Design Studio. Originally designed as children's seating, it is now available in adult sizes as well. More on the Chick 'n' Egg chairs . . .